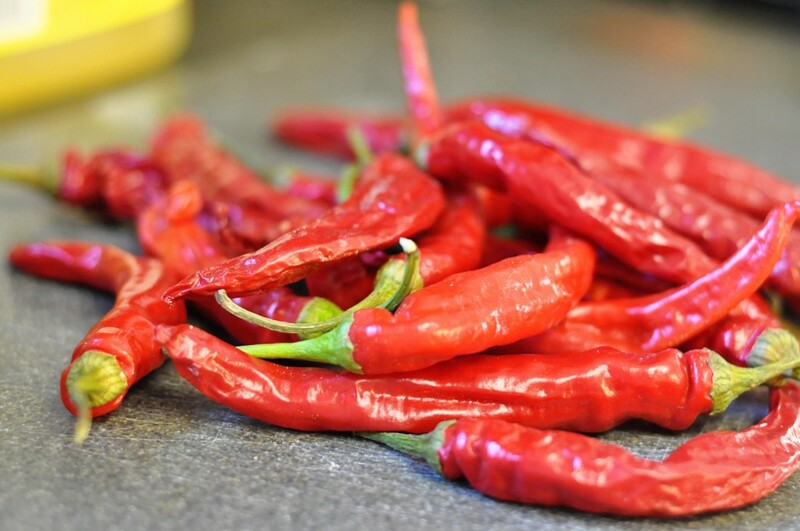 One of the most bountiful but most unused items in my CSA bag each week has been the hot peppers. I made the mistake of thinking one was a mild pepper a few weeks ago and ended up crying into the sink as I scrubbed under my nails and sprayed water into my burning eyes. Today’s free tip: ALWAYS ASSUME PEPPERS ARE HOT. Since that incident, I’ve been stockpiling my peppers in hopes of coming up with a better plan than Horrible Pain A La Face. So when I found myself adding my beloved sriracha to an omelet for the third time in a week, a red hot little light bulb went off over my head. I would show you a picture of what it tastes like, but that might be to racy for this website. Let’s just say it’s like sassy little angels dancing on my tongue and making my diet food tastes a lot less like diet food. So what better to do with my abundance of hot peppers than make my own hot sauce? 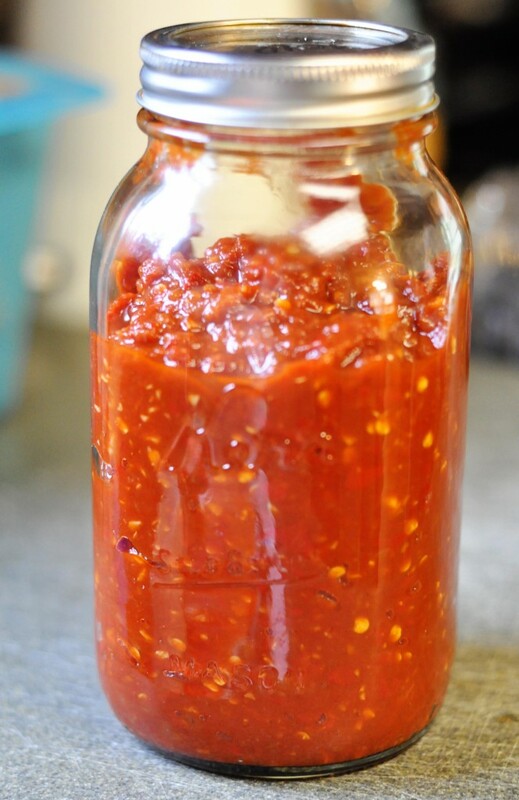 My homemade sauce is surprisingly similar to the bottle sriracha in taste, although it has the pepper seeds in it (like the chili sauce version I also have in my fridge). You could seed the peppers before cooking and run it back through the food processor post-cooking to get a smoother texture, but it would be less spicy. Cut the stems off the hot peppers. Be sure to wear gloves when you’re using them, or at least scrub your hands REALLY REALLY WELL afterward. Mince them well (I used my mini food processor, but don’t put your face right over it when you take the lid off because the fumes are STRONG) and set them aside. Add the oil, minced garlic and minced shallots to a saucepan over medium heat and saute for about 3 minutes until fragrant. Add tomato sauce, tomato paste and peppers and stir it all up well. 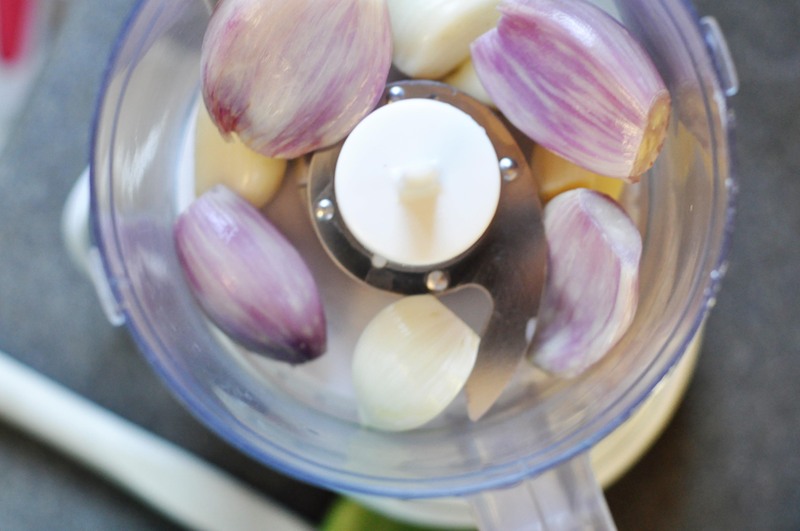 Increase the heat a little bit and add the rest of the ingredients. 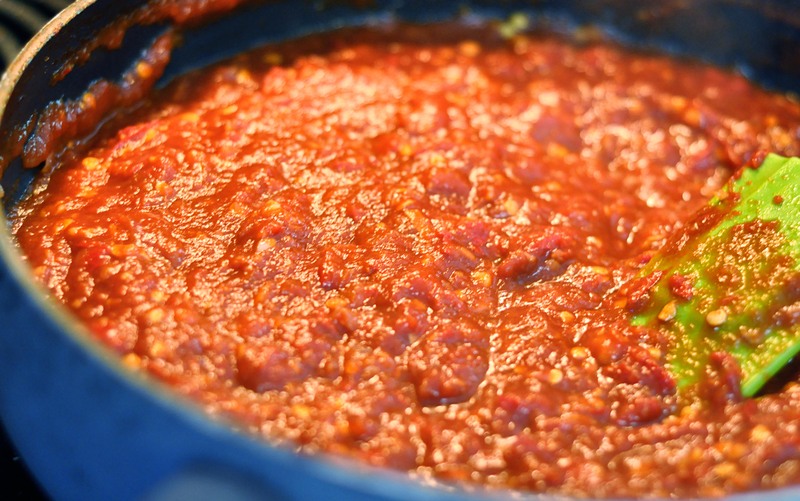 Cook for approximated 8-10 minutes until sauce is saucy and well combined. The bits of pepper will start to fall apart a little. Remove from heat and let hot sauce cool completely. *I don’t know exactly what KIND of peppers these are, but you could use whatever you want. 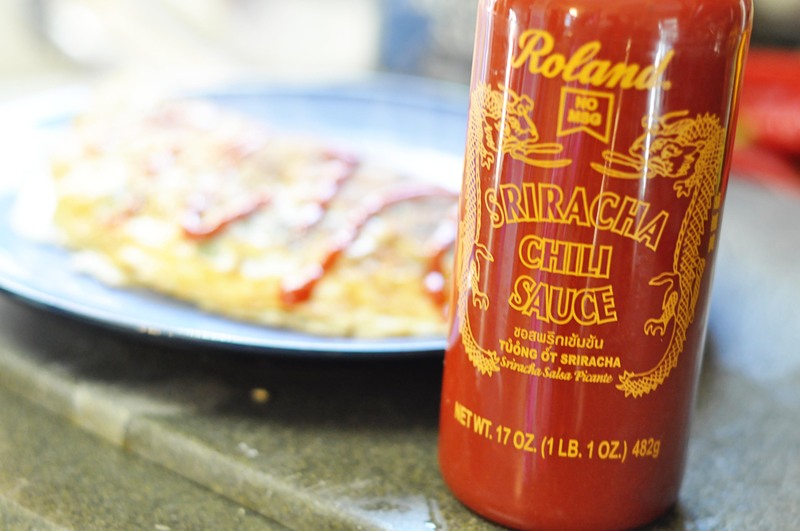 Just remember you’re making sriracha, not the kind of terrifying sauce they put on wings for Man vs. Food. Don’t kill anyone. Enjoy on eggs, potatoes, pizza, french fries, fish, chicken, steak, tacos, or any food served on a Navy submarine (says my husband). It’s pleasantly hot in small quantities, mouth burning spicy by the tablespoon, and I love it so much I plan to take my jar with me on vacation. I’m not even joking.